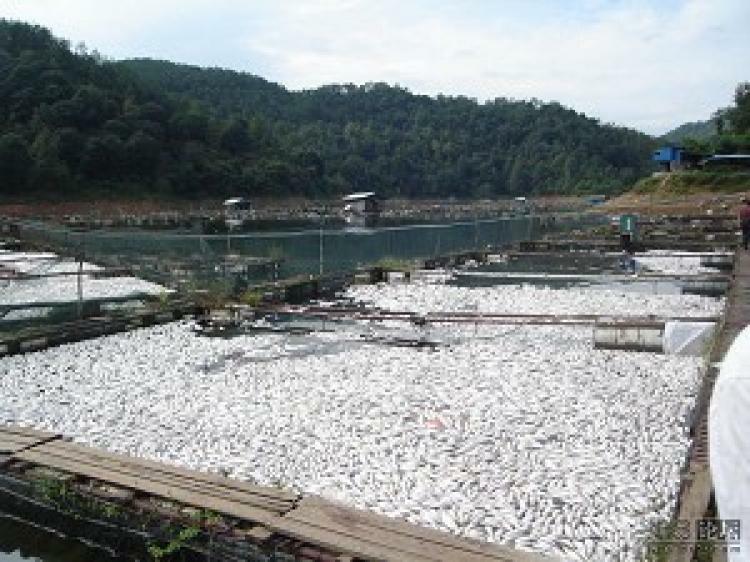 At least 9,100 tons of wastewater from the Zijinshan Copper Mine has been discharged into a local river in southern China, causing nearly 2,000 tons of fish to die, according to provincial authorities. Zijinshan Copper Mine is part of the largest gold-production company in China—Zijin Mining, which is located in Shanghang County, in China’s Fujian Province. According to a report from state-run Xinhua News Agency, on July 12, the mine’s smelter recently discharged wastewater into the Ting River, causing a serious pollution problem as the river is a tourist attraction, and has been regarded as “Hakka Mother River” for its lasting influence on the local culture. The government in Fujian Province categorized the incident as a major environmental accident. An observer in Shanghang County posted pictures on the Internet earlier this month and said that the local authorities initially intended to cover up the pollution. It was not until a large mass of dead fish appeared in the river that the authorities, on July 4, informed the fishermen of the incident. According to a witness, the river water appears dark green with the bodies of dead fish floating on top. A fish farmer said that his family took bank loans and borrowed money from friends to make a living from fishing. Because of the heavy rainfall last month, the government blamed the flood for bringing in pollution from outside the town. The process of gold and copper refining creates wastewater that contains sodium cyanide and heavy metals such as mercury, lead, and iron. Song Xinzhou, from Green Beijing Institute, told Radio Free Asia that wastewater leakage would definitely pollute the surrounding environment.